Virtual Tableau Training Rollout, Edward Tufte Seminars - Attend One! Data is Growing Astronomically - Are Your Prepared? Millions and billions of rows of data are created every day. Ominous or an opportunity? Ablaze Group says, 'Opportunity!' And, to help you succeed,this month we're rolling out our all new Virtual Tableau Training website, and extolling the value of attending an Edward Tufte seminar. Prepared For the “Viz Future?" Data is growing at an astronomical rate -- many predict a 50-fold growth from 2010 to 2020. Just think about all the data that’s being collected every second of every hour of every day. But, what use is it if no one can make sense of it? That’s where data visualization and analysis come in. Tableau is, by far, the best tool to make really fast, visual, informed decisions from virtually any kind of data. Keeping up with this toolset is vital for your future — your career. I’ve been teaching software for a really long time, sometimes more than I’d like to admit. It’s all been “multi-day in person,” either onsite at customer’s training facility, or in a public training environment. Lately, our course participants have been offering lots of suggestions for an alternative. 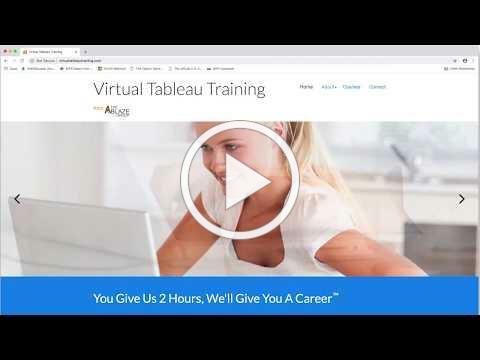 That’s why we launched VirtualTableauTraining.com this week. This new website lays out a series of unique 2-hour Tableau training sessions that I’m looking really forward to starting next month. Whether you’re using Tableau Desktop or Tableau Server, you’ll find introductory sessions if you’re just starting to get a feel for Tableau, all the way up to intense advanced sessions that will help you master all the intricacies of the world’s leading data visualization tool. And, they’re all available via your computer, smartphone, or tablet from the comfort of your home or office. But, this isn’t “self-paced” boring e-learning — it’s still live and interactive. You’re listening to me (and, maybe seeing me if I am brave enough to turn on the webcam) in real-time — if you have a question, want something clarified, or need some expanded detail on a topic, it’s as easy as the chat window, your phone, or computer mic and speakers. As George and I have guided our customers into agile data visualization (the new buzz-term for data analysis that’s not formed around the concept of an 8 1/2 x 11 inch piece of paper), we’ve paid lots of attention to “visualization experts.” While there was some discussion of the likes of Stephen Few and Edward Tufte during Crystal Decisions conferences years ago, it was largely in passing and largely passed over. As newer tools, such as Tableau and Power BI, lean more towards visual best practices (sometimes to a fault — I’m not going to start that “are gauges crap or not” argument again), we’ve become aware of visual best practice thought leaders. We’d always heard about the "Edward Tufte one day class,” but never went. This past July in Denver we did! The event wasn’t intimate in any sense of the word (we were with 500 of our closest friends in a huge convention room at a downtown Denver hotel), however, you still could have heard a pin drop during the “study hall.” Tufte precedes his lectures with assigned reading passages from four of his books, all included with the price of the class. This is an old-school guy (he’s 76 years old and came out of Yale) with an old-school approach to working with new leading edge products. It took me back to some of my best professors at Purdue, in a wonderfully-presented lecture with thought provoking and humorous anecdotes and visual presentations. You owe it to yourself to see him if you can. Tableau and SAP versions are always changing. See what's new on our Release Notes and Updates web page. Bookmark it today!